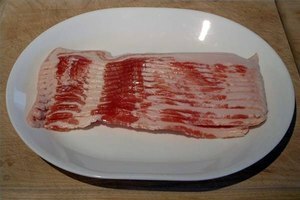 There are several ways to cook a center cut ham slice. Broiling the meat will give you a product closer to baked ham, while pan-broiling or pan-frying the slice will give you more of a steak-like result. 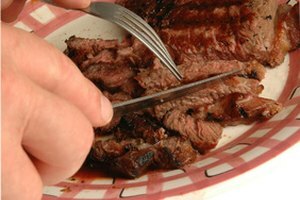 Here's a look at the many ways you can prepare this versatile and delicious cut of meat. Set your oven to "broil." Line a broiler pan with aluminum foil. You can omit this step, but it makes cleanup much easier. Place the center cut on the broiler pan rack. Put it in the oven between 4 and 5 inches from the heat. Broil for about four minutes, then turn. Broil for an additional three minutes for a 1/4-inch slice or six minutes for a 1/2-inch slice. 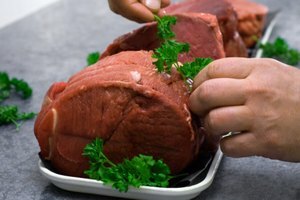 Remove the meat from the oven and allow it to rest for a few minutes before serving. Place a heavy skillet over medium heat and wait for it to warm up. Put the ham in the hot skillet. Don't cover or add oil. Cook for two to three minutes, then turn. Cook for an additional two minutes for a 1/4-inch slice or three to four minutes for a 1/2-inch slice. Remove the ham from the heat and allow it to rest for a few minutes before serving. Pour enough vegetable oil or olive oil into a heavy skillet to lightly coat the surface. Place the skillet on a stove top on medium heat. Allow the oil to heat up. Place the ham carefully in the hot oil. It should make a sizzling sound. Be careful not to get too close to the oil, as it will pop and spit. Cook the ham for two to three minutes, then turn. Cook the ham for an additional two minutes for a 1/4-inch slice or three to four minutes for a 1/2-inch slice. Remove the ham from the heat. Pat down the ham with a paper towel if you wish to remove excess oil. 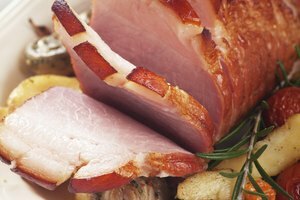 You can add seasoning to your ham before you begin cooking, however most ham is flavorful enough that minimal seasoning is required. Ham is already a very salty meat, so be very light if you decide to season with salt. Michael Larkin has been writing since 2005. He has worked as a photojournalist for CBS affiliates in Spokane, Washington, and Boise, Idaho. He has also freelanced for ESPN and PBS. Larkin currently writes a wide range of material, including corporate newsletters, blogs and ad copy, as well as the occasional magazine article. Larkin holds a Bachelor of Arts in journalism/mass communication from Whitworth College.